Most clients with DSM-5® diagnoses are being treated with a combination of psychological and pharmacological treatments. Newer drugs are being developed to treat mental disorders based on a better understanding of neurobiological contributions to mental disorders and the latest pharmacological research. To provide appropriate services, you are expected to have a thorough understanding of these common and complex issues. As a mental health professional, keeping up-to-date is essential. Specifics of the pharmacological treatment and drugs of choice for Depressive, Bipolar, Schizophrenia Spectrum, Anxiety, OCD, Sleep-Wake, ADHD and Neurocognitive disorders will be presented. 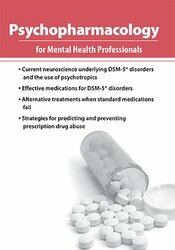 Unique to this recording is information on the common types of psychotherapeutic drugs and other drugs that are abused, and methods for prevention and early detection. Throughout the recording, representative case studies will generate discussion and examination of the latest drug treatment for DSM-5® disorders. You will leave this recording with knowledge and confidence regarding effective and safe application of pharmacological drugs. Disclaimer: DSM® and DSM 5® are registered trademarks of the American Psychiatric Association. The American Psychiatric Association is not affiliated with nor endorses this seminar. For further information, please visit www.dsm5.org. Communicate the neurotransmitter systems and neuroanatomy underlying the biological basis for mental disorders and pharmacotherapy. Evaluate the role of mental health professionals who treat clients receiving both psychotherapeutic medications and psychotherapy. Analyze the major classes of drugs used to treat mental disorders and which mental disorders are appropriately treated with each class of drugs. Compare the effects and side effects of various psychotropic medications, including antipsychotics, antidepressants, benzodiazepines and anticonvulsants. Determine the abuse liability of drugs used in the treatment of anxiety, insomnia, pain and ADHD. Implement methods for prevention and early identification of prescription drug abuse among clients. Why were newer drugs needed? What if first-line antidepressants do not work? What about herbs like St. John’s Wort? This self-study course has been approved by PESI, Inc., as a NAADAC Approved Education Provider, for 6.0 CE in the Couneling Services skill group. NAADAC Provider #77553. PESI, Inc. is responsible for all aspects of their programming. Full attendance is required; no partial credit will be awarded for partial attendance. Nurses completing these self-study materials will earn 6.3 contact hours. Expires: 2/6/2022. This self-study program offers 380 instructional minutes of pharmacology content which is designed to qualify for 6.3 contact hours toward your pharmacology requirement. PESI, Inc. is an AOTA Approved Provider of continuing education. Provider #: 3322. This self-study course qualifies for 6.0 self-study contact hours or .6 CEUs in the Category of Domain of OT and Occupational Therapy Process. The assignment of AOTA CEUs does not imply endorsement of specific course content, products, or clinical procedures by AOTA. Course Level: Intermediate. Expires: 2/6/2021. PESI, Inc. is accredited by the Accreditation Council for Pharmacy Education as a provider of continuing pharmacy education. Successful completion of this Knowledge-based self-study program qualifies for 6.3 self-study contact hours. ACPE Universal Program Number: 0289-0000-17-012-H01-P. You are required to successfully complete a program evaluation/post-test in order to receive a statement of credit.